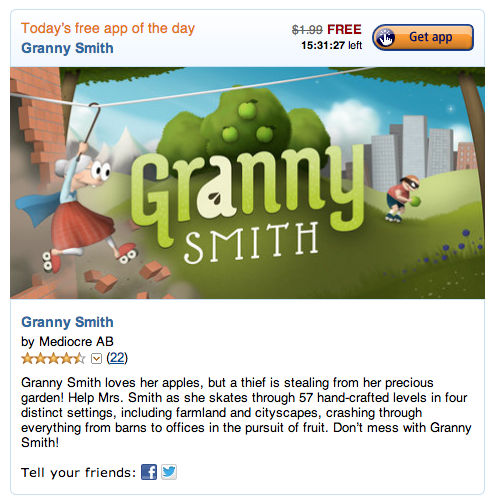 One of the greatest mobile games ever created (yes, I truly believe that), Granny Smith, is available today for free from Amazon’s app store. There has been a running joke around these parts for a year or so over my obsession with this game, so naturally I would tell you that it most definitely is 100% worth installing the Amazon app store to get this deal. That is, assuming you haven’t already paid for it on Google Play or beat the game 30+ different times on 10 or so different devices on both hard and easy modes. Yes, I’ve done that. I’m sick. It’s embarrassing. Granny Smith is normally priced at $1.99. You can download the Amazon app store here.